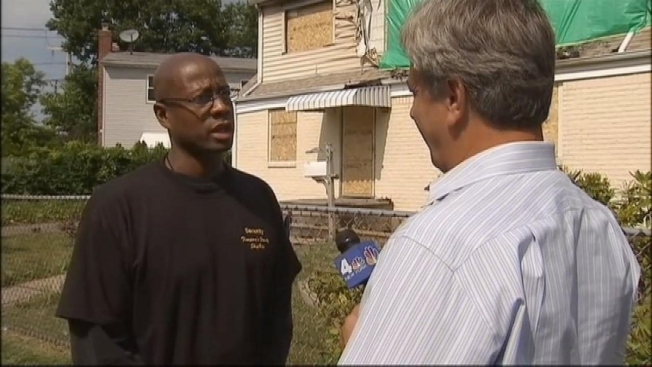 Despite losing their home of 14 years to a roaring fire, a Uniondale family offered thanks Wednesday to the neighbors and police officer who helped rescue them from the flames. “I thank those people and say God bless them,” said mom Ilde Souffrant, who was away at school when the fire erupted Monday night. Souffrant’s husband and two teenage daughters were home but at first were unaware the fire had broken out in a guest bedroom on the second floor. “We didn’t smell smoke or anything,” said Tanisha Souffrant, 15, who was watching TV in the basement. Her dad, Jean Souffrant, was taking a shower and sister Ashley, 17, was in the kitchen, when neighbors began banging on the front door. “We were yelling frantically that there’s a fire in your house,” said Harry Williams, a neighbor who was among the first to reach the burning home. After Williams and others helped get the teens out of the house, Nassau police officer Matthew Andoos joined the rescue. “The girls were quite frantic and said their father was still trapped in the house, in the basement,” said officer Andoos, a seven-year veteran of the department. Andoos entered the smoky home and led Jean Souffrant to safety. “I was quite happy about that because none of my family was hurt,” said Jean Souffrant. Andoos was treated at the scene for smoke inhalation, according to Nassau County police. The cause of the fire is not known but is not believed to be suspicious. The Uniondale volunteer fire department eventually put out the fire; but, one firefighter suffered a broken ankle.